I love dropping by to see the monastic remains here at Castledermot along with Monasterboice it must rank amongst my most frequently visited sites. The 20.12 metre tall tower looks very different in appearance to other towers. 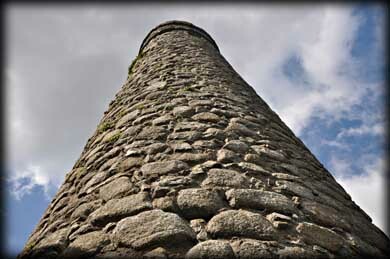 The tower, built in the 10th century, was constructed with large rough granite field-stones that give it a wonderful knobbly texture. At some stage the top floor was rebuilt and battlements added, but that is not the only unusual feature. Normally these round towers were built to the west of the main church with the doorway facing east. 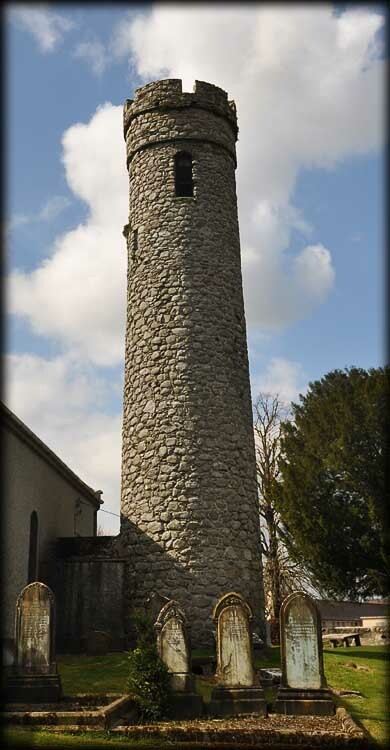 This is the only tower that was built to the north of the church. The present church was built on the site of an earlier church. Another oddity about this tower is the doorway. It was built at ground level suggesting it is early tower. The doorway is no longer visible since it is hidden by a passageway from the nave of the church to the tower. Also located at the site are two fabulous high crosses, the base of another, several holed stones and the only example of a Viking Hogback stone in Ireland. Situated: From Dublin take the N7 west, then the N9 South for Carlow. 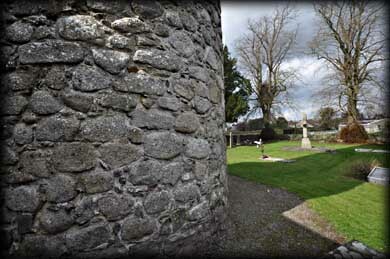 The crosses are in the grounds of St James Church of Ireland, Castledermot. Discovery Map 61: S 7837 8503. Last visit April 2012. Door: Above ground 53cm. Type: Lintelled. Windows: Seven. 1 18th century window, 4 arched windows on the rebuilt 5th floor and 2 original lintelled windows. Features: Tallest door entrance. Battlements.